Brief Synopsis – In a futuristic world, a police officer must try and find out why robots are killing humans. My Take on it – This is a film that I recalled hearing about in the 80’s, but never had the chance to see what it was all about. The fact that it starred Tom Selleck in a sci-fi role also added much to the intriguing aspects of seeing this film. The overall premise of this film is great and despite the fact that the special effects are far from par for even the 80’s, they still manage to give us a very lived-in futuristic world. I’m still amazed by how much this film was able to predict about the future of robotics and computers because they get so much right even without really trying very hard. (See Trivia Section below). 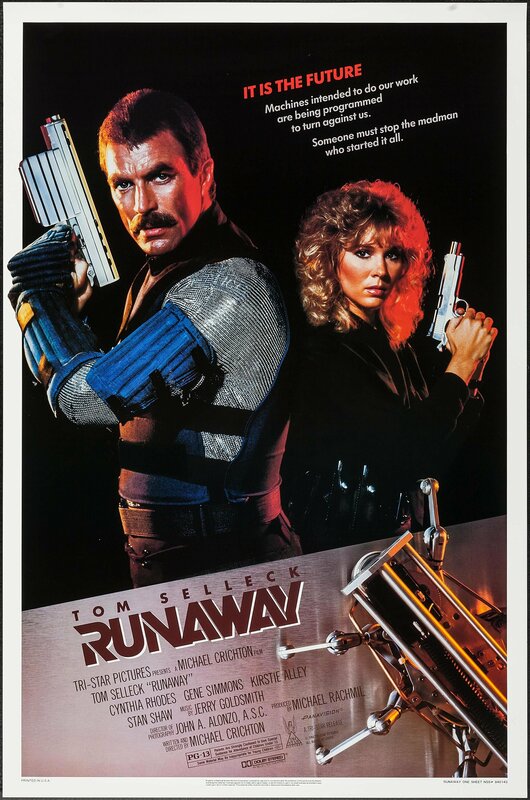 Seeing Tom Selleck in a sci-fi role that is quite different from his persona on Magnum PI is fun to watch even if he pays the character slightly wooden part of the time. The way that the story plays out is intriguing to watch, but one would expect even better things from an 80’s sci-fi film. Casting Gene Simmons as the villain might have been a mistake because he doesn’t seem menacing enough in his actions yet he is able to get down pat the look of a devious and menacing character even if he only comes across as a pretty mediocre nemesis for Selleck. Would love to see this premise updated for today just to see what they could do with such a great premise with modern technology. Bottom Line – Great idea that works quite well despite the poor special effects. The way that this film is able so well to predict the future of robotics and computers is astounding (see Trivia Section below). Selleck does a nice job with the lead even if he sometimes feels a bit wooden. The story itself is done well, but one would expect greater things from an 80’s sci-fi film like this one. Simmons is a pretty mediocre villain, but he does manage to get the menacing look right. Recommended!